Public transportation facilitates immersion in a place. Aging is China’s biggest concern. Reaffirming our commitment to ethical journalism. Trips is great, as long as we don’t forget its lessons. Progressive insurgents may act radical, but their partisanship is nothing new. A letter to America, from an American Muslim. I was the Dartmouth College Republicans' treasurer. Here's why I quit. The College mourns the loss of a loyal son. Trips 2019 matters to the Dartmouth community. Fashion is a driver for body diversity acceptance and respect. Dartmouth must allow for all forms of discourse if it is to better itself. This is an international emergency. Reading Trump’s Rise Through Arendt’s Classic. You take mine, I'll take someone else's. 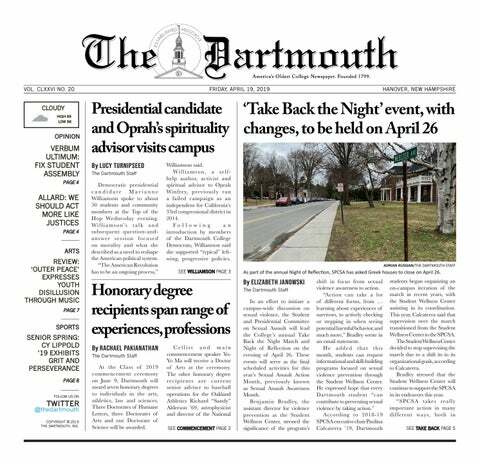 Dartmouth’s prevalent social labels reduce diversity in the community.